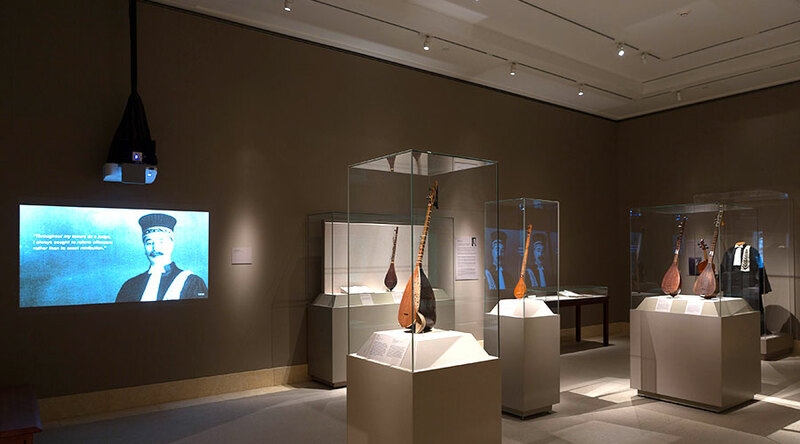 The Sacred Lute: The Art of Ostad Elahi (August 5, 2014 – January 11, 2015) is the first American exhibition to explore the life and music of this renowned Persian philosopher, jurist, and master musician at the historic Metropolitan Museum of Art in New York. Coinciding with the inauguration of the new David H. Koch Plaza after a major reconstruction of the Met’s grand Fifth Avenue façade, this groundbreaking exhibition organized by the Department of Musical Instruments was presented under the patronage of UNESCO. Drawing over 100,000 visitors from across the globe, the Sacred Lute tells the compelling story of a man whose lifelong pursuit of meaning and self-knowledge paralleled the development and evolution of his musical art. Documenting the transformative relationship between player and instrument, the exhibition featured some forty rare instruments and works of art from Ostad Elahi’s personal collection, the Musée de la Musique in Paris, and the Metropolitan Museum, alongside a number of Ostad Elahi’s personal possessions, such as his judicial robes and manuscripts, as well as symbolic items that offered greater insight into his disciplined approach to life. Hosted in the elegant Hagop Kevorkian Fund Special Exhibitions Gallery within the Department of Islamic Art, the exhibition displayed a prominent visual narrative depicting different periods in Ostad Elahi’s life, spanning his early days as a classic mystic to his career as a jurist to his later years devoted to authorship and music. The visual narrative was accompanied by sayings from Ostad’s oral teachings and the perpetual music of his tanbur, imbuing the atmosphere inside the gallery with a contemplative serenity and warmth. Complementing the wall projection was a short film shown on two large monitors that featured excerpts from a forthcoming documentary on the music of Ostad Elahi. Narrated by WNYC’s John Schaefer, the film presents a series of interviews with renowned musicians, ethnomusicologists, and neuroscientists on the unusual creativity and impact of Ostad’s music. A segment with his youngest son and the legatee of his art, Dr. Chahrokh Elahi, demonstrates the innovations and intricacies that Ostad introduced to the tanbur and its playing techniques. Highlighting the various facets of this exhibition were a number of supplementary programs jointly organized and presented by the Met and the Nour Foundation, one of the sponsors of the exhibit. These popular and highly successful events included a series of culturally diverse musical performances inspired by Ostad’s Elahi’s repertoire, interviews, lectures, panel discussions, poetry recitals, and even a rare tanbur masterclass. One of the more surprising aspects of this relatively small exhibition was the tremendous amount of media attention that it garnered. Following a well-attended Press Preview, Voice of America produced a 10-minute video on the Sacred Lute that was broadcast globally, while The New York Times published a full-length review of the exhibit entitled “Honoring an Instrument of Few Strings with the Strength of a Symphony,” certainly an apt description for the distinct sonority of the tanbur. The media coverage wasn’t limited to just the press, however, as the Sacred Lute was also featured as a Curator’s Choice Profile on PBS’s weekly NYC-ARTS television program after one of the show’s producers was overwhelmed by the beautiful music and resounding energy that she witnessed at the Opening Event. The international media likewise took a special interest in the exhibition, with both BBC Persian and Deutsche Welle Persian providing extensive coverage on their respective websites. Even the Met’s own musical blog, Of Note, was filled with scores of entries by local and international visitors alike who sought to share their enthusiasm and excitement about the remarkable exhibition they had seen. One of the ways in which the legacy of this intimate exhibition has been preserved is the release of a commemorative CD-Book co-produced by The Metropolitan Museum of Art and Le Chant du Monde. Featuring two CDs of Ostad Elahi’s music, this trilingual publication in English, French, and Italian opens with an introduction by Ken Moore, Frederick P. Rose Curator in Charge of the Department of Musical Instruments, followed by a brief biography of Ostad Elahi, descriptions of each track, illustrated articles and testimonial accounts on the evolution and impact of his music, as well as select sayings from his oral teachings. The overwhelming response to the Sacred Lute is as much a testament to the profound power of music to unite human beings from every culture as it is to the universal nature of the human spirit. Week after week and month after month, visitors from around the world came to discover, learn, and reflect upon the exceptional music of Ostad Elahi, while catching a glimpse of the radiant personality that brought this captivating music to life and ultimately transformed it into a learned art form. “If used with the right intention,” Ostad Elahi would say, “music can connect us to the Divine, for music is related to the soul, and the soul is related to the Source.” In the case of Ostad, the stunning impact of his music reflects the embodiment of a lifelong pursuit of self-knowledge in the ultimate quest for meaning and transcendence.